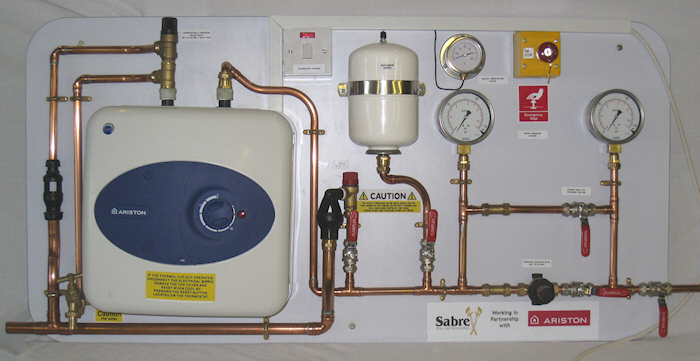 The Domestic Hot Water Unvented Training Rig is designed to demonstrate how a hot water heater should be installed and can be used to show some of the common faults and how these may be rectified. It complies with the training requirements laid down by BPEC. The DHW Unvented Training Rig must be mounted on a suitable wall. It weighs 35 kg when fully charged with water and requires mains water feed and electrical supply. This rig is based on the market leading Ariston Europrisma electric water heater and incorporates various features e.g. isolating valves enabling faults to be introduced within the system for training and assessment purposes. 10 litre Ariston Europrisma under sink electric water heater 10 litre (capacity 3kw). 2 pressure gauges so that the system can be fully monitored. A lockable mains isolating switch to ensure the rig is only used under supervision.